There is no challenge in worsted weight acrylic. It is a tool, and a tool only. No longer do I marvel at the colors, the texture is so-so. I find it to be very serviceable for babies and children, because it wears extremely well and it washes extremely well. But there is no challenge and there is no excitement in the yarn itself, only in the pattern. I purchased a skein of Silk Ribbon Yarn from YarnBabyLLC several months ago. It is green, it is beautiful, and I promptly crocheted it into this thing that was nothing like the thing that was in my head. I grew frustrated, so I put it away. 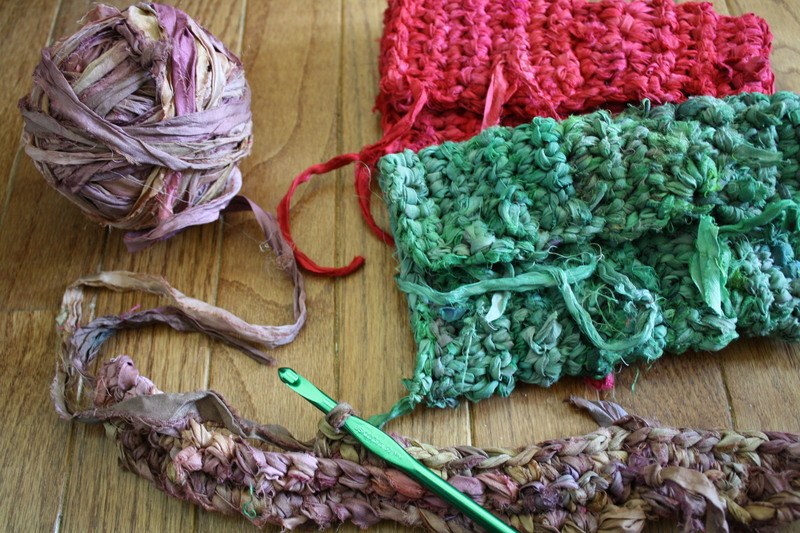 Now what was I going to do with all of this bulky yarn? Each skein consisted of 50-ish yards, not enough for really anything. 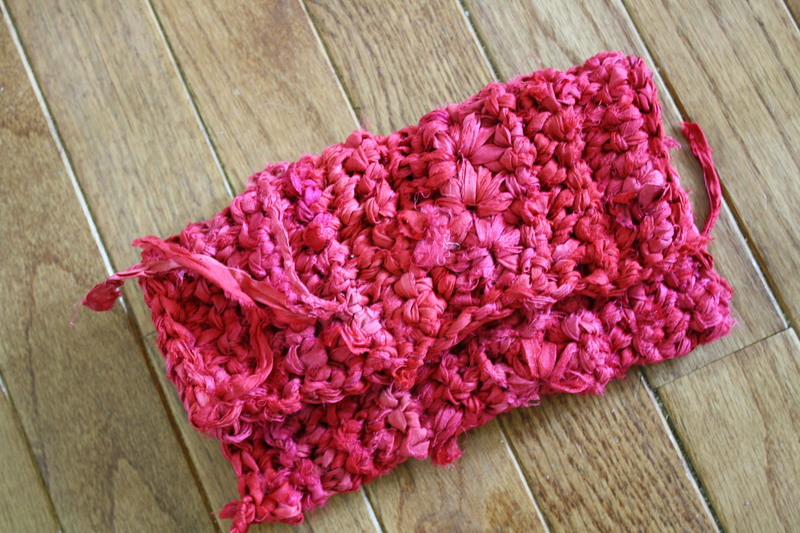 Then I happened upon the Zpagetti Clutch pattern on Ravelry. Designed by Cecily Rosol of Happy Chatter, the pattern calls for a tshirt yarn, but only about 50 yards of it. I decided to try my silk and what a success! It has been a tremendous challenge for me personally. I struggle with perfectionism. And this silk, with its knotted ends and varying widths has made me let go. I had to. Otherwise I would lose my mind. The stitches are not even, they cannot be. But I think that adds a charm to it, a whimsy, a certain carefree spirit. I need more of that carefree spirit. I hope to be finishing the last of these today, then working on the finishing and photography process. Listing on Etsy to take place soon after with the option for custom orders. I see them as bridesmaid gifts, personally. What about you?